Round five is in the books and we are already headed into the sunset. A ten-hour drive west is ahead of us and then the van will back in its place in Denton. This race last year was awful for me. I dislocated my shoulder at the end of the race and struggled all day trying to find speed. Coming into the event I have to say that I wasn’t really looking forward to these Tennessee trails. We arrived on Saturday to great weather and a pit area stuffed full of competitors. I had some tires to change so I knocked that out and then messed with my helmet camera to get it setup for the next day’s race. Sunday morning came and I had my typical Hampton Inn breakfast which consisted of eggs, bacon, yogurt, peanut butter toast, and of course a cinnamon roll just to make sure I had fuel in the tank for the day. We arrived in West Point and I began to prepare my goggles and gear up in my Moose Sahara gear to battle the spring Tennessee temps. The first section was great and I was blown away at how well my KTM was working! The new suspension adjustments paired with my stabilizer gave me a ton of confidence in my front end, confidence that I have been missing in the bike for a while. The gearing change also made my bike rip from corner to corner so I got a little pumped up but was still grinning at the wheelie power of my 250xc. The second section was my favorite of the day despite having a massive wreck. It was a very hilly test with perfect dirt and numerous creek crossings. I was in a great flow and about a mile from the checkout I collided with another rider who was trying to move out of my way. As the rider was moving off the trail he clipped a rock that instantly pitched his bike on the ground. I was not anticipating this so I was pinned trying to continue charging through the woods. My front tire made contact with the other racers bike and instantly stopped. I was separated from my bike and was flying head first into the woods. I was really scared while I was in the air because all that I could think about was my head and neck striking a tree. I made contact with a thick pine tree and I was in pain! I was on the ground for a moment, cussing my mistake, but also worried that I wasn’t going to be getting up. A couple of other racer stopped, which I greatly appreciated, and after about forty-five seconds I was on my feet and headed back to my bike. Charlie rode past as I was starting my bike and luckily the only damage from the crash was a sore neck and a tweaked front end. The third section was much like the previous two and I felt really good on the bike! As the race went on I was getting more and more confidence in my front end. 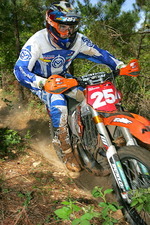 The bike was working phenomenally, and I was having one hell of a time racing in the woods. The fourth section was another run through some fast pine trees and I could feel myself starting to tire out. This was a thirteen-mile test and it required a lot of rider input to stay on the trail going fast. There were some great elevation changes as well as some off camber sections that I was really having fun navigating through. I checked out of this test happy with my ride and was looking forward to the final two sections of the day. The final two sections were tough on me. The trail was pretty cupped out and rough and I tried to focus on charging from corner to corner. I got pretty tired in the last section and ended up the day with an eighth place finish. Not great but I was super pumped on my day! All the changes to the bike were awesome and I finally felt like I could charge without worrying about the trail debris. Charlie once again proved that he is the man to beat and I have to say that he is an amazing rider! He passed me late in the fourth test section and I’ve never seen anyone ride a bike that smooth and fast. A 450 none-the-less! Charlie has shown us enduro regulars what fast is all over again. A big thanks to: KTM, SMS Racing, Moose Racing, Enduro Engineering, Ride PG, Dunlop, Motorex, FMF, Clockwork, Renthal, and Kriega. Special thanks to Bart Hayes, Ben Weathers and the guys at Power Sports Graphics!